I picked up a few plates at Heath Ceramics to use as props for food photos. At least that's what I plan on telling Don anyway. I just love their plates. I would love to have a set, but they're kind of expensive and we don't really need any plates. But I'm getting bored shooting pictures on the same plates. So, uh oh. I now have some new plates in different shapes and colors. (big smile) I can't wait to cook something so I can use them!! The ladies that checked me out looked at my random assortment of square plates and said "Oh, what I nice gift for someone!" I laughed. They're a present for me! Yeah! 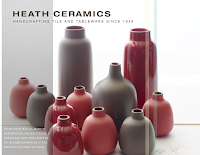 If you're not familiar with Heath Ceramics you should check them out. They have great pottery, dinnerware and tile for kitchens, fireplaces, anywhere I guess. They are based right here in Sausalito, CA. They're not fancy. They are very simple in design. But something about the shapes, colors and the fact that they are hand-made right here makes them incredibly beautiful to me. And now that I have a few pieces I must have more. Bowls. I need bowls. They're beautiful! I love their simple lines, and how authentic they look. I've been meaning to get some props, too. I feel like all my shots look the same (I think I have one dish that's not broken).